At Fantasy Reef you can see many hugged boulders separated by valleys full of coral and marine life. Fantasea or Fantasy Reef just west of Koh Similan, the largest island numbered no8, is one of the best dive sites in the Similans. 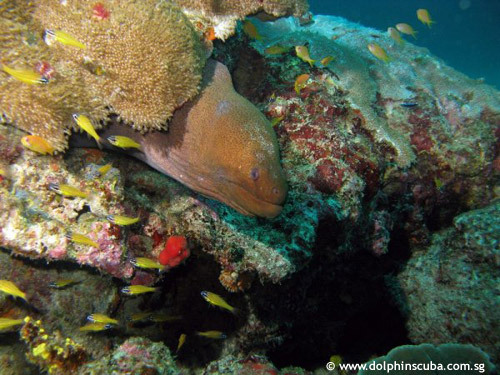 One of the common dive plans is to start at a beautiful coral garden full of hard and soft corals. From there you can visit many huge boulder formations, caves and many swim-throughs that are unique for this area. If you want to dive here contact the local authorities. Fantasy reef has been closed for regeneration to all Similan diving live-aboards since 1999 and according to local news still is. The fish here tend to be nicer than elsewhere and they don't seem to worry much about us. Fusiliers, sharks and all sorts of tropical fish literally swarm this site. Marine life such as the normally shy clown trigger fish, the powder blue surgeonfish, the masked unicorn fish and the Moorish idols are common. Often cow tail rays can be spotted while keeping an eye out in the sand. South East Asia Dreams, a small full-service international online travel agent offers individual and private diving travel packages to selected and remote tourism destination within Thailand and Malaysia. South East Asia Dreams ( former South East Asia Divers) is specialised in attending to the sophisticated requirements of today's divers. We offer remote maritime tourism including exploration, trekking, surfing, fishing, relaxation and mainly Diving. Our interest is to provide a high quality program for individuels, couples and small groups to discover the amazing underwater world in Thailand and Malaysia. explore secluded areas around South East Asia.